Twenty C# Questions Explained: (01) When do you use structs vs classes? Play Twenty C# Questions Explained: (01) When do you use structs vs classes? 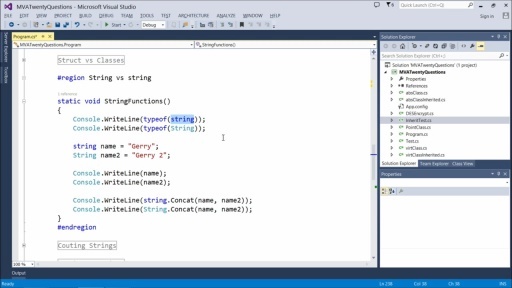 Demonstrate the differences between structs and classes in C#, showing why you choose one over the other. 01: When do you use structs vs classes? 02: How does one parse XML files? 03: What is the difference between String and string? 04: How do I get the application’s path in a C# console app? 05: How do you call a base constructor in C#? 06: How would you count the occurrences of a string within a string? 07: How do you check if a number is a power of 2? 08: What is the difference between break and continue in a loop? 09: What is the difference between abstract and virtual functions? 10: What is the difference between ref and out keywords? 11: How do I encrypt/decrypt a string in .NET? 12: How do I get the index of the current iteration of a foreach loop? 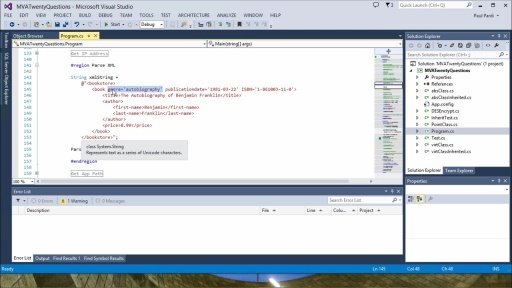 13: How do I get my own IP address in C#? 14: How do I calculate someone’s age in C#? 15: How do I get the string value of an enum? 16: How do I make a text box that only accepts numbers? 17: How do I round a decimal value to two places for output? 18: How do I remove duplicates from an array? 19: How do I sort a dictionary by value? 20: How can I return multiple values from a function in C#? Twenty C# Questions Explained: (02) How does one parse XML files? Twenty C# Questions Explained: (03) What is the difference between String and string? Is it possible to download the project from the network (all tutorial)? Great pieces of code put together !! I wish there also were some real life examples of when a struct would be suitable. What are some common cases where you don't want to pass by reference? I agree with Polarbeer. Interesting discussion on difference between reference and value types, but the question posed in the video title wasn't answered.